When your smile is broadcast to millions of viewers, those in front of the camera entrust their pearly whites to Dr. Victoria Veytsman, owner of Cosmetic Dental Studios in NYC who specializes in smile transformations. Combining art and science Dr. Veytsman is the official dentist for The Miss America Organization, The Miss New York USA Organization, The Miss Latina NY Organization, as well as cheerleading teams including The New York Giants and Brooklyn Nets- creating gorgeous smiles around the world. She is the dentist behind the mega-watt smiles of Orange is the New Black cast members, NFL players, and high profile news anchors to name a few. Licensed in both NYC and LA, Dr. V was the youngest graduate of New York University College of Dentistry at the age of 22. She later completed a residency at St. Lukes-Roosevelt, a Columbia College of Physicians and Surgeons hospital. She also completed many years of cosmetic post graduate programs across the country, a 2-year fellowship at NYU in dental implantology, and a full mouth rehabilitation residency in LA. Adding to her list of credentials, Dr. V is also is a fellow of Academy of Dental Facial Esthetics, a member of the American Academy of Cosmetic Dentistry, The American Dental Association, the International Congress of Oral Implantologists, and the Royal Society of Medicine, UK, and is involved in the Biotechnology Enterprise program at John’s Hopkins University. She treats A-list celebrities, models and TV personalities are amongst her regular clientele and she has also been a lead sponsor of the New York Emmys. 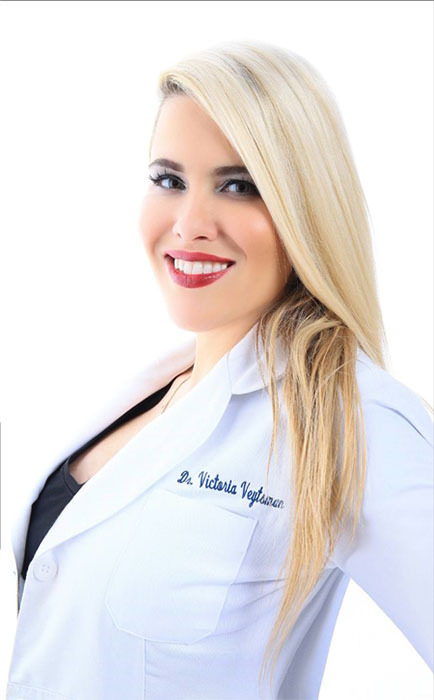 Dr. V has been a featured smile expert in WebMD, NewBeauty, Latina Magazine, Brides, Yahoo!Health, Social Life Magazine, Hamptons Magazine, NBC’s The Today Show, is a Beauty Ambassador for Haute Living magazine and is a regular contributor on Sirius XM radio. One of the core values of the practice is giving back. Her charitable and philanthropic endeavors include working with the The Robinhood Foundation, Women for Women International, Bowery Mission, Urban Tech, the National Hemophilia Foundation, Smile Train, B4BC.org, Autism Speaks, and Coalition for the Homeless. “Dr. Veytsman is an amazing dentist!! I’ve always been petrified and scared of going to the dentist. Her and Jessica make you feel extremely comfortable and a home. I am so excited to be able to smile again. I almost cried when I looked​ in the mirror to see the results. The best experience I’ve ever had at a dentist before” T.Y. “Dr V. is the best! She is both incredibly precise and uniquely warm, kind and nurturing. I have never looked forward to going to the dentist so much. Had Invisalign, a filling and bonding as well as check ups with her and always the same wonderful experience. Not to mention my smile went from looking very English to a million dollars! Fantastic investment.” J.C.